Having proof is critical to forecasting sales revenues and it’s also critical to optimizing landing pages. Without proof that a particular version drives traffic and boosts conversion rates, marketers will find it difficult if not impossible to get the additional resources or funding they need for further development. Testing provides the proof marketers need to predict how a landing page will perform and what impact that imposes on lead generation. Marketers not only need proof, they need a reliable source of that proof. As customers vote with their actions (or inactions), marketers can glean the data they need to add, change or remove elements on the landing page. When multiple versions of a landing page are tested, customer’s actions can dictate what converts, and that in turn will determine the changes needed to build an optimal page. Thank you page – Use a page that thanks the prospect and confirms their actions. Also use this for other relevant offers or to drive sign-ups to email newsletters, ‘likes’ in Facebook, etc. Before B2B marketers consider publishing a landing page, they need to consider all the components required. Creating the right mix of relevancy, benefits and testing will give marketers the formula they need to build optimal landing pages. 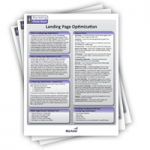 Check out Marketo’s Landing Page Optimization Cheat Sheet for quick tips on choosing which pages to optimize first, top metrics to use when measuring marketing ROI, basic components that aid in improving your conversion goals, and much more!